Dr. Postol and his team hope you had a happy holiday and a wonderful new year! 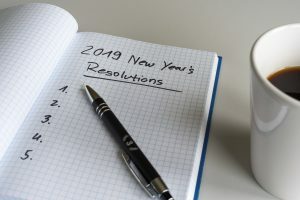 Now that 2019 is here, the team is hard at work in the office, working on New Year’s Resolutions. Some of the most common resolutions are exercising more, eating better, and saving money. But, your Ballwin cosmetic dentist recommends you add in some dental resolutions to make your 2019 a happier, healthier year. Eating crunchy, healthy foods like apples, celery, and carrots help to scrape away food particles and plaque that accumulate on your teeth. Plus, fruits and vegetables are good for you, so this resolution can cover multiple goals! 2019 is the year to quit smoking! Smoking cigarettes and even vaping have negative effects on your dental and overall health. If you work to quit smoking by the end of the year, your teeth will thank you! The risk of gum disease and oral cancers decrease by a large margin after you quit smoking. Sugary cocktails and excessive drinking can have an adverse effect on your teeth. Studies show that drinking too much can contribute to gum recession. Try to cut back on drinking when you go out, and be sure to brush your teeth afterwards! Dr. Postol recommends you brush your teeth at least twice a day, and floss once a day. Brushing in the morning and at night will clear away any remaining food particles and bacteria, and will help prevent cavities, gum recession, and tooth decay. Flossing can get food particles and plaque that your toothbrush can’t, and can help protect your teeth against gum disease. One of the best ways to improve your dental health is seeing your dentist more often! Many people only see the dentist if they have a problem, but Dr. Postol recommends that you come in for regular checkups so he can help prevent any problems from happening. Plus, if you are interested in cosmetic dentistry, tooth restorations, or even TMJ treatments, he can help you out. Work these 5 resolutions into your schedule, and your dental and overall health will thank you! Your dental health and overall health are connected, so when you take care of one, you can also take care of the other. Schedule an appointment with Dr. Postol today to get a start on your New Year’s Resolutions! As one of the best dentists in Ballwin, Dr. Postol can help you get the smile of your dreams.